This is the hit series ALARM FOR COBRA 11, produced by my friends at Action Concept. The third Writers Room "showrunner" seminar got off the ground yesterday here in Lohr, Germany, taught by me and my friend Matt Witten. The way we teach together, it’s less of a lecture and more of a day-long discussion about various aspects of writing and producing episodic television shows. Lots of anecdotes and experiences are shared along the way between us and the students. It was fascinating for me to learn more about the differences between the German television industry and ours — and discovering common ground. Things that are second-nature to us — like the four-act structure — are new concepts to the writer/producers here and it’s exciting to see them embrace it with genuine enthusiasm. We’ve watched and analyzed both good and bad episodes of US television shows, some times stopping after every scene to discuss it. I am having a great time…but it’s also very exhausting to be "on" from breakfast clear through drinks in the bar late at night (in fact, it’s often during the those casual conversations outside of class where the real progress is made). And before crawling into bed, I try to make some progress on my other work. (Thank God they’ve got Diet Coke here!) It will be very interesting to compare and contrast this experience with the one I’m going to have in two weeks when Bill Rabkin and I teach the course in Sweden. Greetings from the Franziskushohe, my friend Hermann’s cozy hotel on a snowy hillside overlooking Lohr, Germany…an idyllic little village where Snow White supposedly lived. My wife tells me that Snow White is a French fable, not German, but apparently the people of Lohr think otherwise. The town doesn’t seem real to me, but you can blame years of movie-going for that. Lohr looks like a Hollywood version of what a German village is supposed to look like. Writer/producer Matt Witten, who is teaching here with me this week, had exactly the same impression. Right now it’s about 11 am here (2 am back home in LA) and I am sitting in the dining room at a table by the window, watching the snow fall, working on my fifth Monk book and sipping hot Earl Grey tea. (Jet-lagged must have wallopped Matt, because he still hasn’t emerged from his room). If you’d told me a year ago that I would be here right now, I wouldn’t have believed it. I’m trying to get in as much uninterrupted writing as I can before tomorrow when the "students" (professional writer/producers, screenwriters, directors, and at least one actor) start arriving from all over Germany and the real work begins. I’ll try to check in here, too. Last week, ABC announced they were "updating" Raymond Chandler’s Philip Marlowe as the basis for a possible TV series set in present-day Los Angeles. Now Universal Pictures has announced that they are developing a new Marlowe movie, a period-piece that will star Brit Clive Owen. decided which title to adapt. with Marlowe continuing to be the hard-drinking, wisecracking gumshoe. My friend Barbara Seranella passed away today. She was 50 years old and had been in ill health for some time. I knew her for years and admired her talent, her humor, her tenacity, and her kindness. I will particularly remember a long night playing poker with her in El Paso…she beat us all. I wish she could have beaten this, too. I’ve been away in New York for a few days at the Mystery Writers of America board meeting and am just now catching up on my favorite blogs. Ordinarily, I’d build whole posts around some of the stuff I’ve found…but I’m too lazy. So you will have to see for yourself what Emmy Award-winning writer Ken Levine has to say about Aaron Sorkin’s dig that he wasn’t a "real" comedy writer. And you’ll have to experience for yourself the utterly bizarre "Galactica-A Team-V" crossover fanfic that my brother Tod stumbled upon. 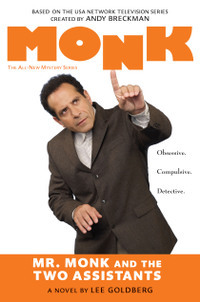 MR. MONK AND THE TWO ASSISTANTS. (Click on the image for a larger picture).